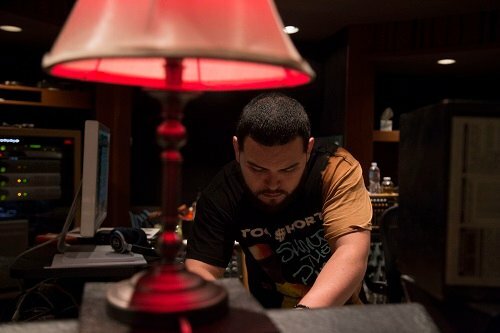 Over the past few years 2012 Recording Connection graduate of the Audio Engineering & Music Production Program, Morning Estrada (Los Angeles, CA) has engineered for numerous players in hip hop, pop, and R&B. That work includes Camila Cabello’s album single “Never Be the Same” (Camila), Jessie J’s 2018 release R.O.S.E. (produced by Grammy-award-winning producer Camper), and tracks for Nelly, 50 Cent, Tech N9NE, Linzi Jai, Marsha Ambrosius, Noah Cyrus, Trinidad James, Mr. Porter, and more. Morning also engineered extensively on Aminé’s album Good for You, including the songs “Heebie Jeebies featuring Kehlani,” which he both mixed and recorded, and the Gold-certified track “Spice Girl” (recorded). Again, Morning was in the engineer’s seat for the artist’s latest release, the album OnePointFive. We caught up with the booming audio engineer just as he was packing to catch a flight and join Aminè on the European leg of the TourPointFive tour. So you’re going on tour with Aminé throughout much of Europe? And even prior to Aminé asking you to join him on the European leg of his tour, you worked with him in Hawaii. Is that correct? “We did a week in Hawaii and worked out of the studio where Kanye West did 808s & Heartbreaks and My Beautiful Dark Twisted Fantasy. A buddy connected us with him. So we had a studio, and every day we went on an activity. So we did something like zip lining one day, we went to go see Jurassic Park, where they filmed the movie, another day. We also did a helicopter ride around the island. Rather than coming back to the U.S. after the tour, you’re flying straight to Spain to work with rising star Rosalía. How did that come about? “I had worked on the Camila Cabello album (Camila) and the executive producer on that is Frank Dukes. So Frank referred me to Rosalía. She listened to some of my work and wants to collaborate on a few ideas. She’s looking for a specific sound and being that I’m an engineer, she wants my assistance translating that sound through the speakers. She had reached out to me thru instagram. It was out of nowhere. I was kind of in shock because I’m a fan, of course, and she just won two Latin Grammys. Aminé had put me onto her. And we’re both big fans of her album that just came out (El Mal Querer)… Yeah, so when she messaged me, I said ‘This is not real. Why is she messaging me right now?’ I thought Aminé was playing a joke on me. So we met last month in L.A. and things are going really well with her.” Follow Morning on Instagram @mixedbymorning. Morning, you’ve got a whole lot going on and it’s happening superfast. How are you feeling? What’s your advice to Recording Connection students and people who are on their path, striving to make it in the industry? Learn more about Morning Estrada’s journey.